Very well laid out, tastefully decorated and spacious studio apartment with a 10m2 terrace. Large glass doors to the terrace to let in lots of light and makes the apartment feel larger than it really is. The kitchen is well equipped with everything you need for breakfast, lunch or dinner. You will have a sofa bed that is easily converted into a double bed. We can also arrange an additional bed for a child. The terrace of 10m2 which extends along the entire apartment with afternoon and evening sun. Fully tiled bathroom with shower and washing machine. 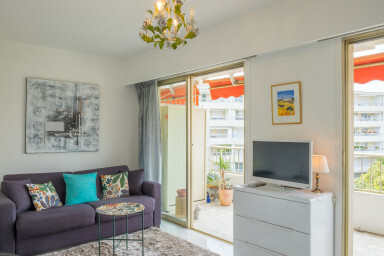 The apartment was renovated 2014 and with new furniture. The apartment is located on Rue Cirodde, a street without directly through traffic. The location is quiet yet close to both restaurants, shopping, Rue d’Antibes and nightlife in the Carré d’Or district. Only 5 min on foot to the beaches along the Croisette. Car parking is available for free in the street so you can simply forget the car and enjoy the delights of Cannes by foot.